Before Toby came along, I sometimes found myself with enough time to bake a loaf of bread from scratch. It was delicious and ridiculously satisfying. But since around October last year I haven’t had time to think about it. Anyway, I’ve been stalking ebay for a few things for our house recently, and thought I’d check out the breadmaker situtation. $60 later we scored ourselves a big loaf bread machine! 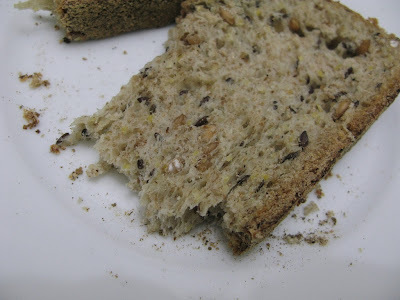 I used it twice yesterday, to make a fruit loaf and a soy and linseed wholegrain loaf, and can I tell you how delicious and easy it was. Just add your ingredients, press a few buttons and three-ish hours later, yummy bread. I’ll freeze half of each loaf so we can use it over the weekend. The fruit loaf I did from scratch but the soy and linseed loaf I used a Laucke breadmix. Both ways turn out at around $2 per loaf, which is tops. I know that breadmakers fall into that ‘Christmas present you you use twice and then stick in a cupboard and feel vaguely guilty about’ category (hence the number of them on ebay, I’m guessing) and I also know that they use a bit of electricity and are bulky to store. BUT its a matter of weighing up the pros and cons and we figured, considering we’ll use it 2-3 times a week and save at least $20 off the groceries bill every fortnight, that it was worthwhile. I’ll let you know how we go, but for now, I’ve got a breakfast date with some fruit loaf and a strong black coffee. The kids have both been up since 5am. Eugh. and figured I’d add the remainder to this post, because they’re not used as often as the four major ones above. Find it in the laundry aisle at the supermarket. Laundry: Use it in your homemade laundry detergent. 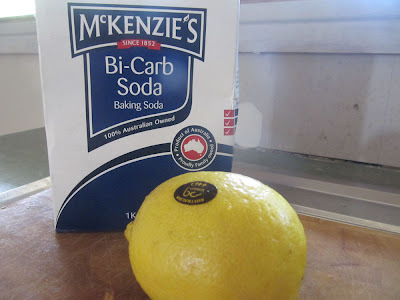 Laundry Brightener: When washing with castile soap, I add a couple of tablespoons of washing soda for all loads except darks. It helps brighten and soften the clothes and I think they smell fresher. Laundry: Add 1/3 cup to your dark laundry loads to preserve the black in your garments. Make sure to purchase essential oils, rather than scented oils, as the latter can be almost as harmful to your health as the chemical cleaners you’re trying to avoid. It’s also worth checking that you don’t have an adverse reaction to any particular oil before using it all over the house. Additionally, pregnant ladies need to be cautious around essential oils as some can stimulate labour. Laundry: Add 10 drops to your rinse cycle for beautiful smelling clothes. Plus some oils, like tea-tree and lavender, have antibacterial qualities, making them great to wash things like fabric nappies. General Cleaning: Add a few drops to your homemade cleaners for a nice change. General Cleaning: Add 20 drops to a spray bottle and use as a room freshener. Dusting: A damp microfibre cloth sprinkled with a few drops of lavender oil makes the whole room smell lovely. Lame, but true. Washable Chux cloths: Generally once they’re done in the kitchen, I wash them and add them to the cleaning cupboard. They’re reusable and do a good job of tackling most tasks. Microfibre Cloths: $3 for a pack of four at the Reject Shop. Get some. I use a damp cloth to do all my dusting, plus they clean glass and make rinsing and wiping out basins, vanities, baths and showers super easy. They are brilliant. Plus you just throw them in the wash and use them time and time again. Spend a little bit extra and get the good spray bottles from Bunnings or somewhere similar. The cheapies are fine for mild cleaners, but I found that when I put vinegar in them, the spray mechanism would stop working after a week or two. I bought some Oates ones about a year ago and haven’t had any issues since. There really isn’t much involved in getting your green cleaning toolkit together, and it becomes second nature really very quickly. Let me know if you have any specific questions or things you use in your green cleaning. I’d love to get some more ideas! Sparky and I are still very much in the furnishing and decorating phase of the renovation (not to mention the painting phase…ahem) and we’re on the look out for quirky bits and pieces to adorn the walls. 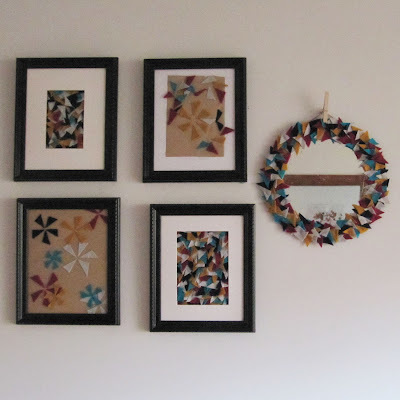 Proviso: we don’t have a lot of cash to spend on this stuff at the moment, so we’ve been looking at what we already have and ways to reuse and repurpose it into wall ‘art'(?). I subscribe to frankie, and every issue they include a pretty wall poster by an emerging artist. Last issue was a world map, which I loved. I’m kind of past the whole “stick posters to the wall with Blutac” thing – it just reminds me of my high school days way too much (Jonathan Taylor Thomas, I’m talking about you in particular) but I wanted to see it on the wall somehow. 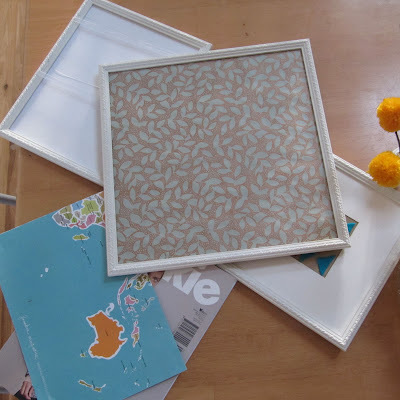 I dug around in my project box (where I keep odd photo frames, cardboard, paper and fabric offcuts etc) and found some old white frames that I’ve lost the glass for. Perfect! 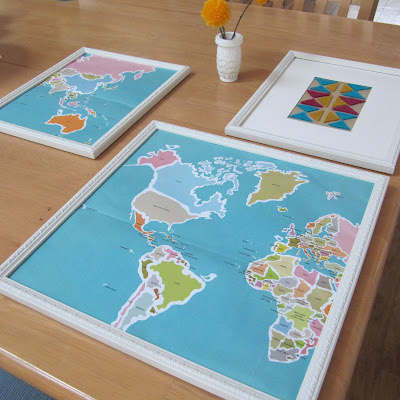 I cut the map to fit and presto! 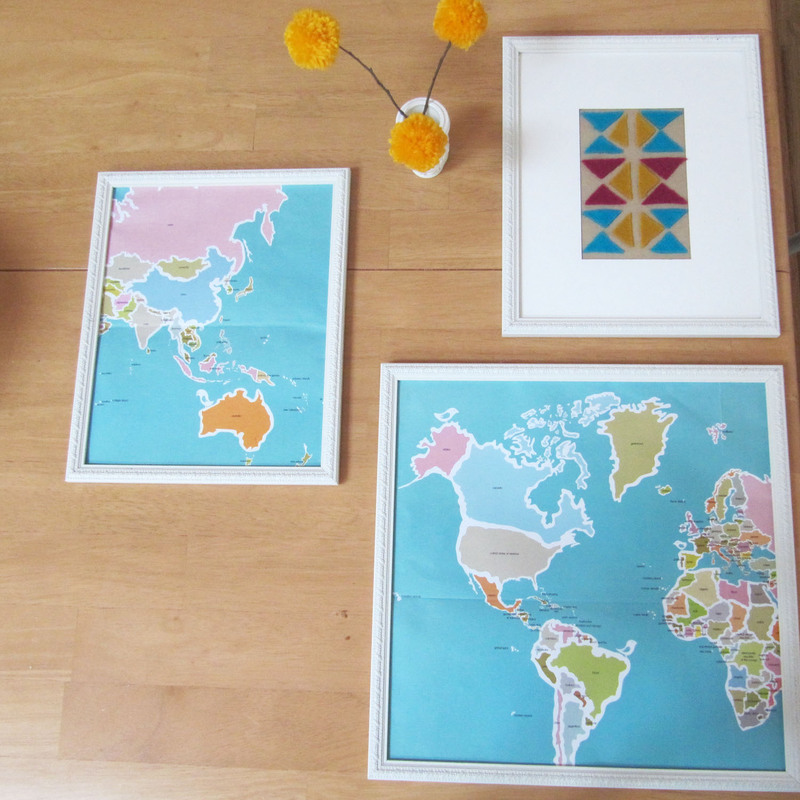 I already had another white frame decorated with felt offcuts, which coincidentally matched the map colours well, so I think I’ll hang these three together somewhere. 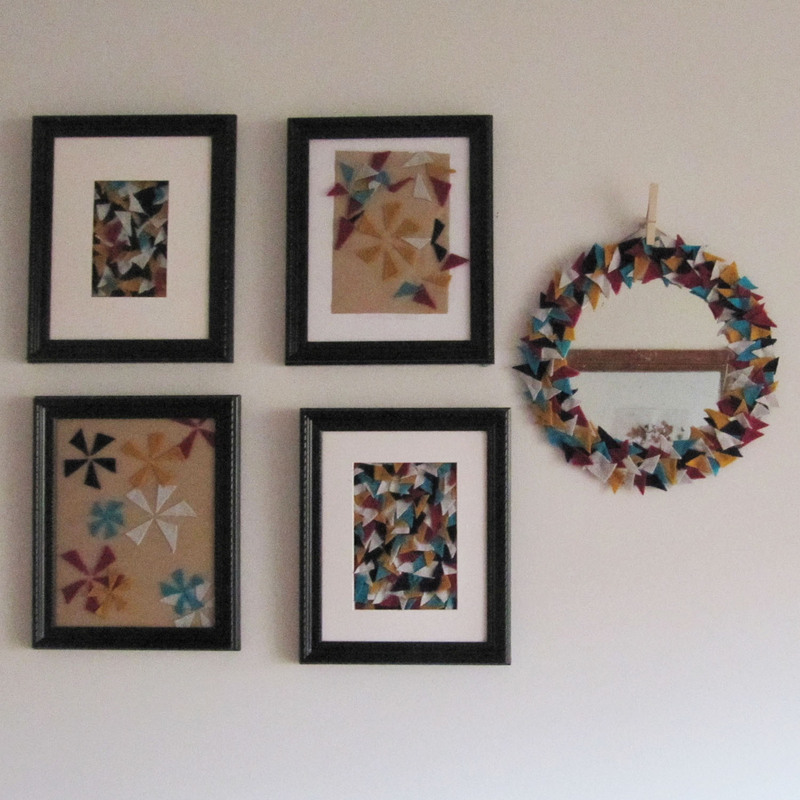 I did something similar with more felt offcuts a few weeks ago, and while the photo is craptacular, I’m actually really happy with the result. 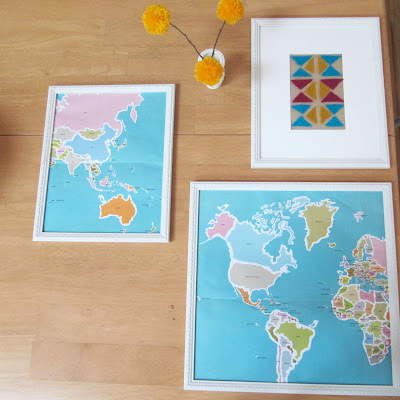 I showed the mirror repurpose a few weeks ago, and these pieces are just continuing the theme. Isy helped me with the top right-hand piece, hence the reason it’s much more beautiful than the others. I really love being able to pull things together from scrap and leftovers. Sure, it’s not high art. It’s probably not even art at all. But I love it nonetheless. Last weekend was chock-a-block full of projects, which suited me just fine. (I love, love, love a good project.) Sparky oiled the back decks (more on that below) and I started painting the front door and kept working on the neverending job of painting the timber trim. The front of the house (paint-wise at least) is nearly finished – hopefully this weekend will see the end of that particular task – and while we still have a shedload of painting to do, to see something finished has really spurred us on. 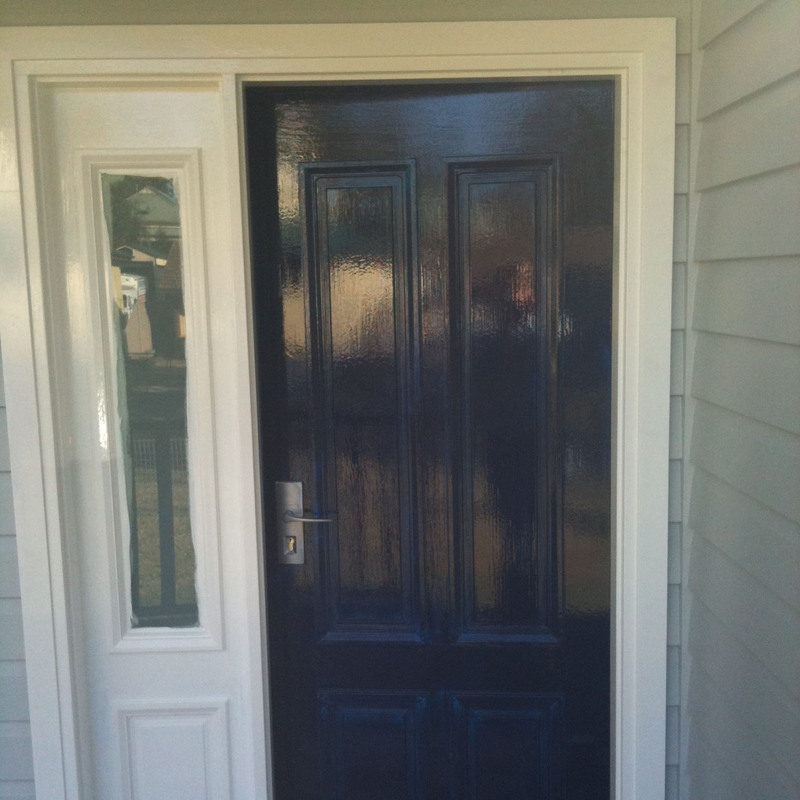 On Sunday I picked up a tin of enamel paint for the front door (Blue Lobelia by Dulux) and gave it the first coat. Gotta say I’m really really pleased with the colour so far. To have a painted front door is ridiculously satisfying! The colour is pretty vibrant and the paint-shop guy told me I would’ve been better off using a grey undercoat instead of white, but you live and learn. It just means I’ll probably need to do three coats instead of two. 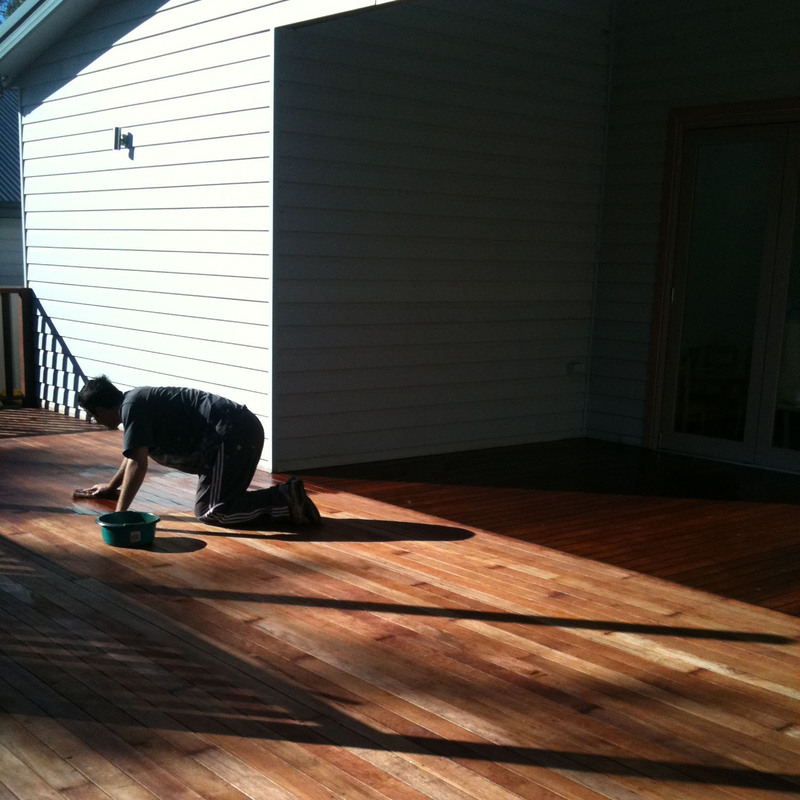 Sparky also finished the deck with Organoil, and it has come up so beautifully. By his account it’s super easy to apply and I love the fact that it’s non-toxic and smells like eucalytpus oil. Two initial coats are needed, then one in six month’s time. After that we should be able to go 12 months between oiling. 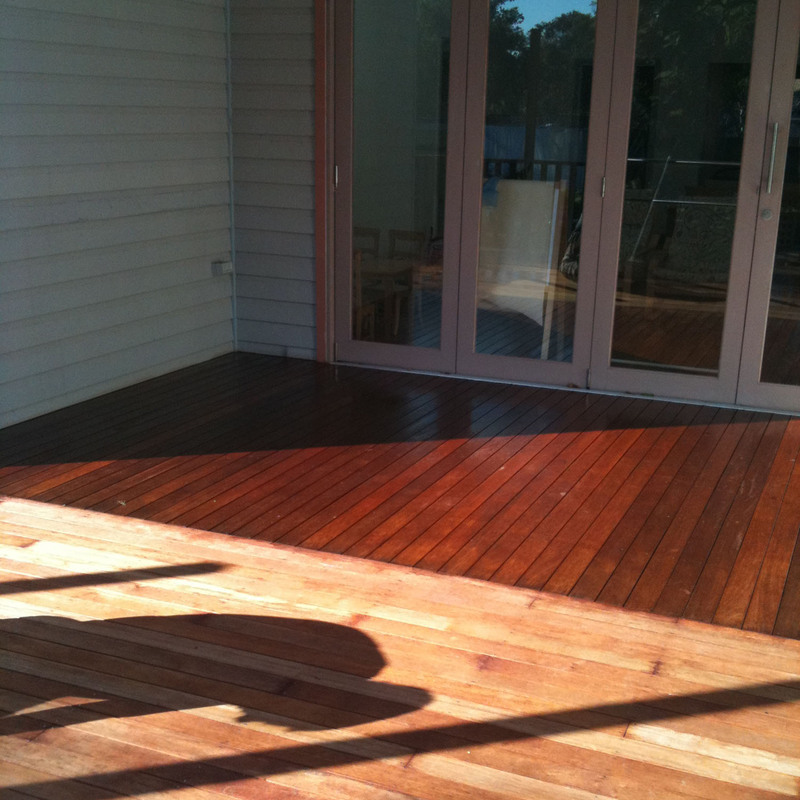 You can see the difference between the oiled timber and the raw new deck. I also spent some more time finishing off the paving. When we took out the garage and the slab, there was a whole mess going on with the border, so we tore it up and I’m in the middle of relaying it. Not a huge job but it’s getting us closer to the end! – Construction is done for now. We will put a roof over the new deck eventually and have to build a storage shed/studio in the backyard at some stage in the next 12 months or so, but no real rush. – The back deck is finished. Just need to tidy up some loose ends and get us some retro cane armchairs to do some lounging on. – I’ve started a master plan for the gardens and will slowly start to work on the beds as time allows. 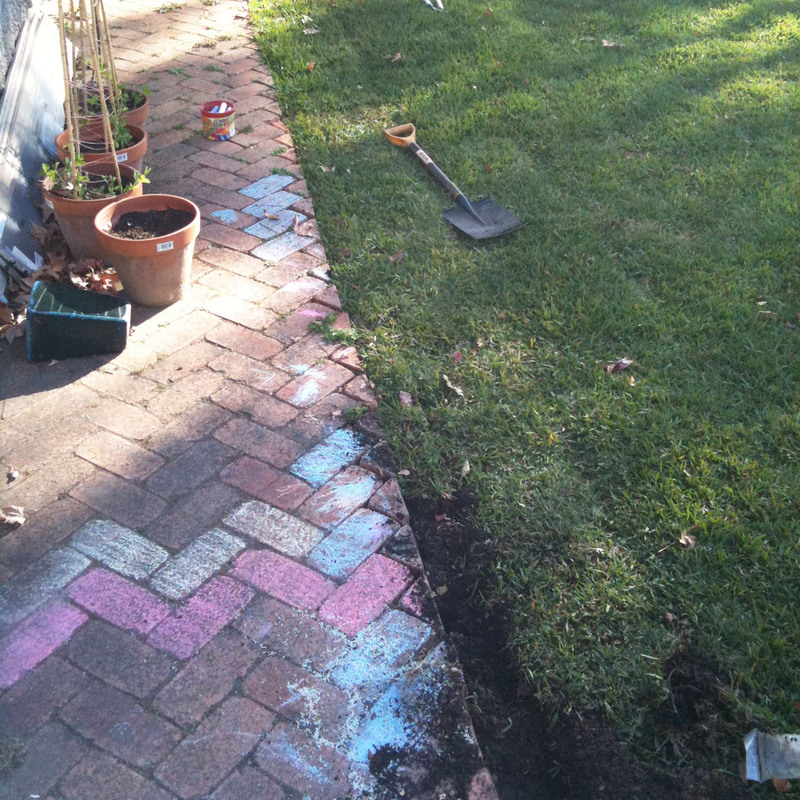 I’ve had to finish off some paving jobs, but they’re nearly done now – thankfully. – We’ve decided on the kitchen renovation plan now – a cheapy refurb rather than an all-out replacement, which makes me happy. (Buying further into the K.I.S.S philosophy: Use what you’ve got before looking for brand-new replacements.) As a result, I’m now stalking eBay for second-hand shelving, a butcher’s block and a stepladder. – We still haven’t finished painting inside, but we’ll get around to it eventually. Everything is undercoated, so if you squint it kind of looks painted. – Slowly figuring out how best to furnish the new space and, again, stalking eBay for a mid-century lounge, some wireframe chairs, a dining table and a bookshelf. This is what Sparky and I like to call, “A bogan special,” meaning it’s a bit low-rent but a lot delicious, so who cares. Plus, I’ve been called worse than a bogan over the years! It’s easy, comforting, tasty and Isy eats it, so it floats my boat – especially this time of the year! 2. Add your chicken, trying to get some of each fillet on the base of the pan. You want to brown it well, to seal the flavour in. 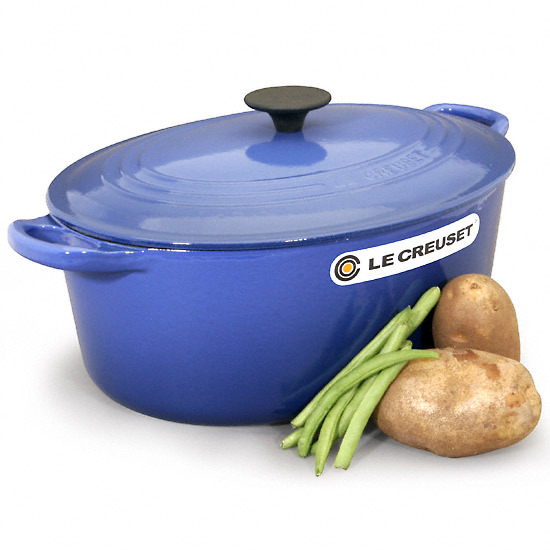 It doesn’t matter if some sticks to the base of the pan – that’s where the flavour comes from.